Looking at dozens of previous studies, Copenhagen University researchers suggested these appeared to raise, not lower, the risk of early death. More recent theories suggest that certain vitamins consumed as part of a healthy diet - and perhaps taken in supplement form - may be able to prevent damage to the body's tissues called 'oxidative stress' by eliminating the molecules called 'free radicals' which are said to cause it. This damage has been implicated in several major diseases including cancer and heart disease, yet the implication that vitamin supplements might protect people from these illnesses is controversial. The Copenhagen team reviewed more than 815 clinical trials into the benefits of vitamins A, E, and C, alongside beta-carotene and selenium - all commonly-used supplements. They selected 68 whose methods were more likely to produce an accurate picture of vitamin benefits, then added their results together to form one, large-scale study. This overview suggested that taking antioxidant supplements neither increased, nor reduced, the risk of early death. However, when the researchers eliminated a further 21 trials which had a slightly higher possibility of producing a skewed result, the picture changed considerably. While the risk of death was unchanged among selenium and vitamin C users, a statistically significant increase in risk emerged for the other three supplements. Beta-carotene produced an approximate 7% increased risk, vitamin E a 4% increase and vitamin A, a 16% increase. The researchers wrote: "Our findings contradict the findings of observational studies claiming that antioxidants improve health. "Considering that 10% to 20% of the adult population in Europe and North America may consume the supplements, the public health consequences may be substantial." They said there were several different explanations for this increase in risk - and suggested that knocking out 'free radicals' might actually interfere with a natural defence mechanism within the body. 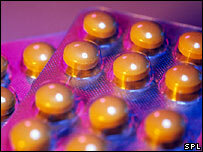 The team called for more research into the effects of vitamin supplements on health. Dr Frankie Phillips, a nutritionist at the British Dietetic Association, said food contained a complex matrix of different components which could not be replicated by supplements. "Our advice is to eat a wide range of foods in a balanced diet which can provide all of the nutrients the body needs to protect itself and combat diseases." Ellen Mason, of the British Heart Foundation, said: "We would recommend that you only take substances to protect against heart disease, whether dietary supplements or drugs, that have been proven in well conducted clinical trials." However, Dr Ann Walker, of the Health Supplements Information Service, said the findings of the study were "worthless". She said some of the studies which had been examined by the Copenhagen team involved patients who were already seriously ill.
"How sensible scientists can suggest that a modest intervention of a single antioxidant supplement, can have a major effect in reversing life-threatening pathology, where patients already have advanced cardiovascular disease, is ridiculous. "Vitamin, mineral and dietary supplements not only have proven health benefits, they are essential to the maintenance of good health and can help bridge the nutritional gap for many people in the UK whose diets are often lacking in essential nutrients."